The Vigil has written to two prominent British MPs to seek their support for the expulsion from the UK of a Nottingham GP Dr Sylvester Nyatsuro and his wife Veronica who have seized a farm in Zimbabwe. There is a letter on our campaigns page about the Nyatsuros which supporters can send to their own MPs (see: http://www.zimvigil.co.uk/vigil-news/campaign-news/764-suggested-letter-to-your-mp). One of our supporters Emmaculate Tshuma was picked up by the immigration authorities early on Wednesday morning. Emmaculate, who is only 18, was dragged out of bed and treated very roughly and is now in detention. There is a petition to the Home Secretary about how she was treated. To sign go to: https://www.change.org/p/rt-hon-theresa-may-mp-stop-the-deportation-of-emmaculate-to-zimbabwe?recruiter=52935447&utm_source=share_petition&utm_medium=copylink. A video about this is available here: ROHR Condemns the violent and unlawful detention of its UK member Emmaculate Tshuma. A collection was made for Emmaculate at the Vigil. Zimbabweans await with baited breath the outcome of Mugabeâ€™s visit to Japan. Not to hear what tea was served at his meeting with the Emperor but because the purpose of his journey is obviously to consult his doctors in Singapore for a second time in the past few weeks. Quote of the week: â€˜Zhuwaoâ€™s statement is the height of crass insanity and vindicates the PDPâ€™s position that there are no genuine reformers in Zanu PF, but only looters and grabbersâ€™ â€“ Peopleâ€™s Democratic Party spokesperson Jacob Mafume, speaking about the 1st April indigenisation deadline set by Mugabeâ€™s nephew. See the article by Eddie Cross of the MDC T for an analysis of the lunacy involved: http://www.zimbabwesituation.com/news/zimsit-m-april-fools-day-the-zimbabwean/. 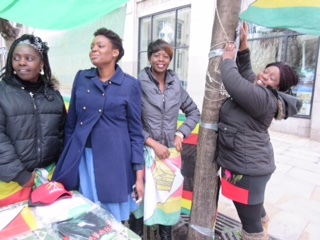 On a blustery wet Easter Saturday thanks to those who were there at the start to set up: Tatonga Gutah, Isabell Gwatidzo, Fungayi Mabhunu, Anna Mafunga, Michelle Makoni, Patricia Masamba, Eletha Mpofu, Roseline Mukucha, Fungisai Mupandira, Marlon Nyamakanga and Chipo Parirenyatwa. Thanks to Roseline, Isabell and Etines for looking after the front table and to Chipo for selling all the wristbands we had at the Vigil. Thanks to the team who put up the tarpaulin and the high banners: Tatonga, Fungayi and Marlon. Thanks also to those who stayed till the end to help pack up: Rashiwe Bayisayi, Tafadzwa Buka, Percy Dube, Isabell Gwatidzo, Etines Kapiya, Fungayi Mabhunu, Anna Mafunga, Michelle Makoni, Patricia, Masamba, Lipi Mhlope, Eletha Mpofu, Roselyne Mubayina, Roseline Mukucha, Fungisai Mupandira, Beverley Mutandiro and Chipo Parirenyatwa. ROHR International UK Chapter Training Day. Saturday 2nd April from 12 noon â€“ 5 pm. Venue: The Salvation Army, Kildare Street, Leicester LE1 3FY. Directions: opposite the Peking Chinese Restaurant in the City Centre. Training covers outline of ROHR International, leadership skills and departmental operations. Contacts: Tino Mashonganyika 07463272078, Enniah Dube 07403439707 and Nicodimus Muganhu 07877386792. Swaziland Vigil. Saturday 2nd April from 10 am to 1 pm outside the Swaziland High Commission, 20 Buckingham Gate, London SW1E 6LB. Monthly Itai Dzamara protest Saturday 9th April from 2 â€“ 6 pm outside the Zimbabwe Embassy in London. The protest is to mark thirteen months since Dzamaraâ€™s abduction by intelligence agents. ROHR Coventry Relaunch. Saturday 9th April from 2 â€“ 9 pm. Venue: Binley Private Membersâ€™ Club and Banqueting Suite, 50 Grange Avenue, Binley, West Midlands CV3 2ED. Â£10 a head for all you can eat buffet, children free. Contacts: Melody Magejo 07490913486, Gladys Muduve 07956 430115, Edward Murota 07979312148 and Sally Mutseyami 07448730581. ROHR Central London Branch â€˜Mugabe must goâ€™ protestâ€™. Friday 15th April outside the Zimbabwe Embassy from 11 am to 1 pm. Please come and join Central London to make a big statement on the Friday before the 36th anniversary of Zimbabweâ€™s Independence. 36 years of Mugabe â€“ time to go! ROHR National Executive meeting. Saturday 16th April from 11 am to 1.30 pm. Venue: Strand Continental Hotel (first floor lounge), 143 Strand, London WC2R 1JA. For directions see below. The Restoration of Human Rights in Zimbabwe (ROHR) is the Vigilâ€™s partner organization based in Zimbabwe. ROHR grew out of the need for the Vigil to have an organization on the ground in Zimbabwe which reflected the Vigilâ€™s mission statement in a practical way. ROHR in the UK actively fundraises through membership subscriptions, events, sales etc to support the activities of ROHR in Zimbabwe. Please note that the official website of ROHR Zimbabwe is http://www.rohrzimbabwe.org/. Any other website claiming to be the official website of ROHR in no way represents us. Zimbabwe Action Forum (ZAF). Saturday 16th April from 6.15 pm. Venue: Strand Continental Hotel (first floor lounge), 143 Strand, London WC2R 1JA. From the Vigil itâ€™s about a 10 minute walk, in the direction away from Trafalgar Square. The Strand Continental is situated on the southside of the Strand between Somerset House and the turn off onto Waterloo Bridge. The entrance is marked by a sign at street level. It’s between a newsagent and an optician. Nearest underground: Temple (District and Circlelines) and Holborn. Nottingham demonstration against farm looting Zimbabwean doctor. Friday 29th April from 12 noon â€“ 3 pm. Venue: outside The Willows Medical Centre, Church Street, Carlton, Nottingham NG4 1RJ. The Vigil and ROHR are continuing the campaign to have Dr Nyatsuroâ€™s British citizenship revoked. More information to follow. ROHR Birmingham Branch Independence Ball. Saturday 30th April from 3 pm till late. Venue: Centrala, 4 Minerva Works, 158 Fazeley Street, Birmingham B5 5RT. African cuisine, Â£20 a head, children free. For more information, contact: Gladys Muduve 07956 430115, JaneMary Mapfumo 07412 310429 and Tecla Bandawe 07450507650. Play: â€˜After Independenceâ€™. 4th â€“ 28th May at the Arcola Theatre, 24 Ashwin Street, London E8 3DL. The play is by May Sumbwanyambe and tackles the issues of independence and government in Zimbabwe. More information is available here: http://www.arcolatheatre.com/event/after-independence/2016-05-04/. The producer has contacted the Vigil for our input and plans to visit us to discuss this. Zimbabwe Vigil Highlights 2015 can be viewed on this link: http://www.zimvigil.co.uk/vigil-news/campaign-news/746-zimbabwe-vigil-highlights-2015. Links to previous yearsâ€™ highlights are listed on 2015 Highlights page. The Vigil, outside the Zimbabwe Embassy, 429 Strand, London,Â takes place every Saturday from 14.00 to 18.00 to protest against gross violations of human rights in Zimbabwe. The Vigil whichÂ started in October 2002 will continue until internationally-monitored, free and fair elections are held in Zimbabwe. http://www.zimvigil.co.uk.